Firm Profile – Oliver Treadwell – Attorneys serving the Lake Martin, AL area. Results matter. Oliver and Treadwell, LLP takes extra ordinary steps to ensure every client, business or individual, receives the best possible outcome for the legal needs they may experience. Whether it be defending a business in complex litigation or representing an individual charged with DUI; Oliver and Treadwell’s proven record of results for each client is the hallmark of the firm. Simply stated, we win. While no particular result is ever guaranteed, clients can expect every effort will be made to achieve a victory. From the courtroom to the board room, Oliver and Treadwell has the experience to provide representation in diverse areas. While it is a general litigation firm covering a broad spectrum of practice areas, it also provides general counsel for large and small businesses and institutional clients. When a legal need arises, hire the lawyer that is closest to the court house—literally and figuratively. As a local firm, the relationships developed within the area are vital in reaching that best possible result. Oliver and Treadwell provides the legal knowledge, experience, and local reputation necessary to achieve a client’s goals. 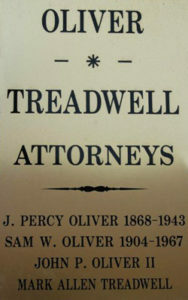 Oliver and Treadwell, LLP traces its heritage to July 1889. It was on that date that J. Percy Oliver (1866-1943) was admitted to practice law in the Chancery Court of Tallapoosa County, Alabama. 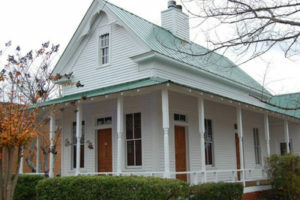 Thereafter, J. Percy Oliver maintained a local general practice in Dadeville, Alabama, with various partners and associates. He also served as Probate Judge of Tallapoosa County for many years. Judge Oliver’s practice was later assumed and continued by his son, Samuel W. Oliver (Mr. Sam) (1904-1967). Mr. Sam’s country law practice encompassed a wide ranging field of client representation. Mr. Sam was prominently known throughout the State of Alabama as one of its most effective litigators in the defense of criminal and automobile liability cases. Shortly after Mr. Sam’s untimely death, his son and associate, John P. Oliver, II (1942-), grandson of Judge J. Percy Oliver, assumed the practice. He is currently of counsel for Oliver and Treadwell, LLP. As a solo practitioner between 1967 and 1971, John P. Oliver, II, continued his predecessors’ general law practice and branched out into the fields of plaintiff personal injury representation, consumer law, and real estate development and acquisitions. In 1971, the firm was constituted as Oliver & Sims with the addition of L. Lee Sims. In 1992, Mark Allen Treadwell, III, joined the firm and became managing partner in 2002. Growing up in Dadeville, he moved practice from Birmingham back to his hometown and has practiced with the firm since then. With the departure of Mr. Sims in 2002, the firm became constituted as Oliver and Treadwell, LLP. In addition to its two lawyers, the firm employs two paralegal assistants with over forty years combined experience.